ZEN8 Series are a range of 35W 8″ LED Downlights with IP44 waterproof rating, 3000K or 4000K light colour and option of white or satin nickel finish. 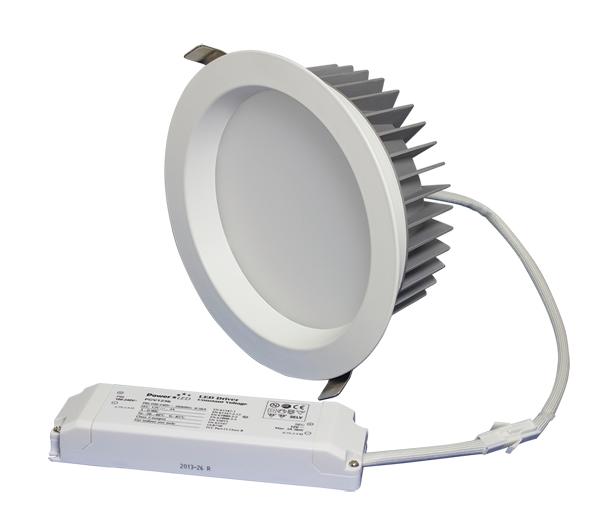 ZEN8 Series are a range of 35W 8″ LED Downlights with bright lumen output, low glare, IP44 waterproof rating and anodised aluminium heat sink. The complete fittings ensure low maintenance costs and 85% energy savings opportunity when compared to traditional down light fittings; all making them ideal for installation in domestic, commercial and retail lighting applications. These LED downlights utilise a highly efficient LED chip and reflector system, have a fixed 100° beam angle and are available with a 3000K or 4000K light colour and option of white or satin nickel finish. Each down light is supplied with quick connect external dimmable driver, with fireproof cable sleeving for extra safety, that is compatible with leading edge and trailing edge dimmers. Optional emergency pack, EP3, is also available for use with ZEN8 Series if you are looking to make the downlights operate as emergency lighting as well.